Adding relevant images of your brand or service can make a huge impact in determining the success of your Facebook ads. For marketers, it's becoming a challenge to keep up new changes Facebook announces every week. You can almost expect strategies you were once using yesterday, to be overhauled tomorrow. Facebook's 20% rule was slyly changed (but not completely removed) recently as new guidelines were integrated into how much text images could be displayed. Image Text OK - If your image has nearly little to no text (other than a company logo,) typically your ad will run normally and reach the estimated amount of people. Image Text Low - With a low classification, your ads may be restricted in reach. Image Text Medium - Ad images with slightly higher text display will reach even lower counts. Image Text High - If the image you uploaded is determined to be in this class, you have too much text and your ad may not be displayed at all. 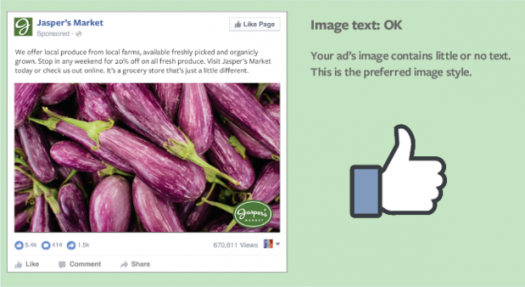 Have you tested your Facebook ad campaigns with images that include text and ones without? Let us know your results! Newer PostInstagram vs. Snapchat - Who Tells The Better Story?